Epic ******* post, MX. Great job! I did update the "Hidden Stats" thread to include the Warhorse splash area (you are correct, it is 20) and Jackal info. could you take a look at the calculations of mine and MX and clarify which is correct or if both are worng and how are they calculated ?? and also WrongThinker told that in the first second of firing the unit would fire double times than shown in the hidden status thread . means a war horse fires its first bullet a 0 second and reloads and another bullet at 1 sec so this also should be taken in consideration when calucalting the damge(or) reload from Techs of SF ??? You can get the comp mag in the current shadow ops tier 3 prizes,not sure how long this will be around. Something else we could really use additional clarification on is how EXACTLY Kara's Blood Lust capability works. Any time Kara or a Member of her SF Team kills any enemy unit, she gains a 10% bonus to Damage and a 5% increase to Reload Speed, up to a maximum of 200% bonus Damage (after 20 kills) and 50% increased Reload Speed (at 10 kills, thus reducing her reload time to 1 second when maxed)." Thank you very much for the quote and the link. That is greatly appreciated information. Thanks a million. With this information, it would lead me to believe that ALL LSD from the same Building are all counted as one kill towards that 20 kill count. So I guess the only other questions I have would be, what all counts as "One kill" towards that 20 Kill count? Each Buildings Set of LSD? Do downed Bunkers/Watchtowers count as "Multiple Units" coming out, or do they get treated as "One" like LSD appear to be? THIS POST NEEDS TO BE PINNED! WHY HASN'T THIS BEEN STICKIED YET DAMIT!?!? Gets REALLY Tiring having to search for this thread every other day or so just because I forget stuff on a regular basis. if you want to bookmark it just click the star to follow. I have a question for the OP. How do other components affect this math? For example High impact ordinance adds 12% damage at max level and Heavy Ordinance adds 30% /-15% movement at max level. Just curious how these would affect the math. 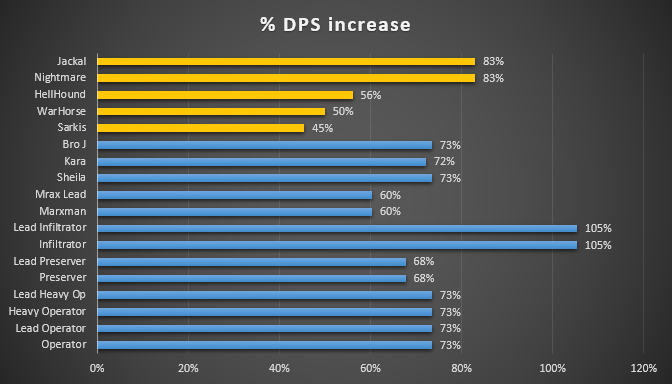 Wanna tell us how Press the Attack (Leader ONLY Tactic / +15% TEAM damage) and Storm the Front (10-60% additional damage based on distance to target) will help out in these popular builds with all the popular units? I personally think Storm the Front won't be too helpful for most builds...about the same as Take aim most of the time...since SF won't be getting too close it will likely be closer to the 10% of that 60% additional damage amount...but considering Take Aim reduces Reload Speed by 20%...it might be actually AT LEAST a better option for Kara since its some damage in that slot and grants no Reload reduction to her. Might make Kara's best build be: Press the Attack...with Comp Mag, Heavy Ord, and Storm the Front. Thank you for these excellent points & thought provoking questions! - Insta-kill LSDs with AOE damage. - The weapon itself has extra range ( +25 maybe?). - Can trigger enemy units under normal stance. 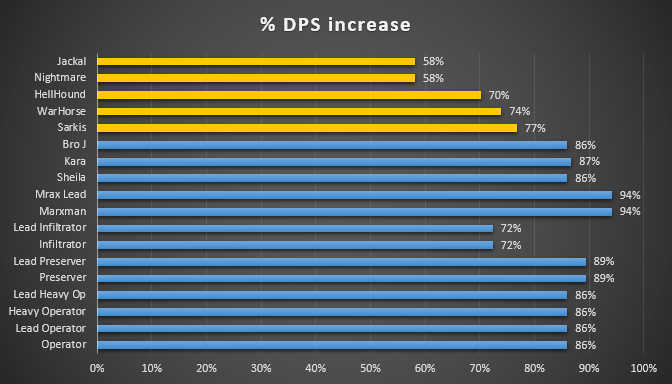 but it adds a fixed amount of ( 2133) to DPS compared to the % from other components. still prefer [Caution Order] or [Take Aim] over M4GX. i would do that too! using her alone most of the time, sometimes with a slave infiltrator behind her equipped with Charged Ord. + M4GX. Each kill must give her a bonus of 10% Reload Speed cap at 10 kills. or a 5% bonus cap at 20 kills. in order to reach the Reload Time of 1 second. i believe LSDs don't count toward her BL ability. an if they do count they would be as a 1 kill. Not sure! Bunkered units should be separate targets, example: a fireteam of SF inside a bunker. i have planned a test to find out exactly how her ability works & what counts toward boosting it. still waiting my friends to finish their war to test that. These Direct Damage components will positively affect the math for sure. 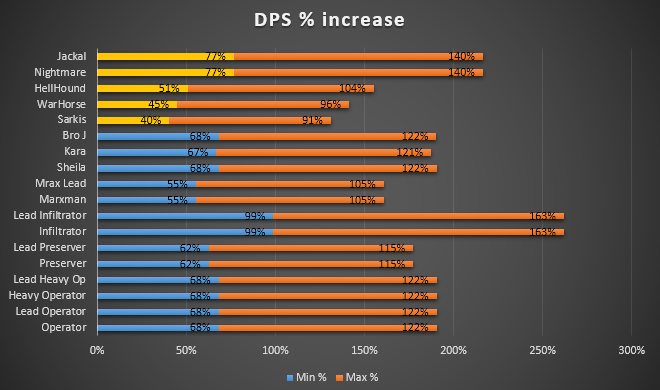 i did't add them to the charts because i wanted to isolate the effect of the other components that affect the DPS indirectly. will be adding them later. kixeye released it as a counter to the [Toxic Offender] and maybe the NightOwl too!. and it would have helped us big time during the Halloween event if it was released back then. However, I'm still not quite sure about how this range:damage ratio is calculated! do we get a 10% at Full Range or does it start at zero?! - If we have a maxed Kara with a 550 range and a Scorpion charging at her from far away. - In order to calculate the bonus relative to her position, Kara has to be stationary (she acts like a Microwave Turret). - Full Range = Kara's range. - Current Target's Distance = how far from Kara the Scorpion is at this moment. you're right, [Press the attack] component would be great on any leader. working on getting the same build for her too. ♦ Bonus damage stacks additively. ♦ Units with blue bars are affected by the bonuses from the Command slot, they are either a leader\Hero unit or members influenced by their leader's bonus. 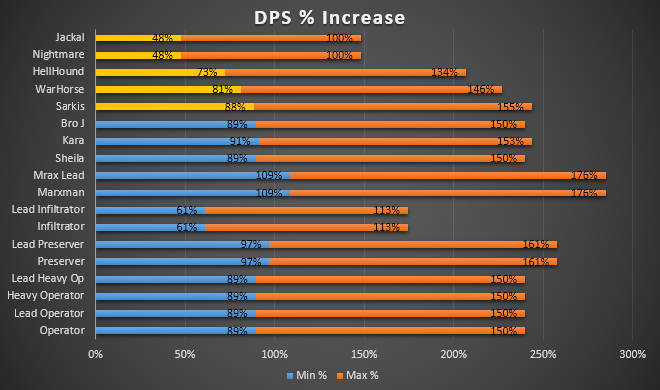 ♦ Reaching the maximum DPS is NOT always the best thing, Weight the benefits against the drawbacks before choosing a design. - works great on all units especially marxmen as long as you keep them above 50% health, but be careful if your units' health drop below 50% they take 25% more damage. - Caution Order increases the space capacity of your units by 6%. Still a good combination for boosting the DPS of most units. lower % than #1 but your units suffer less damage when under 50% health. Nightmares, Jackals, and Infiltrators took the most advantage from this build. 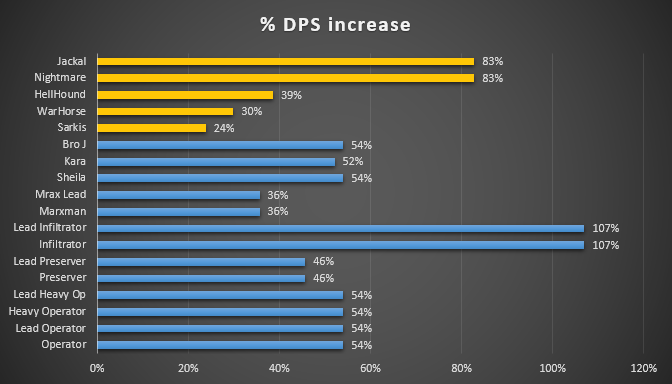 higher DPS at the cost of 25% reduced movement speed! and more damage when under 50% health, be careful! you better change the loadout to [Impact Ord] or any other component. More benefits for the Nightmare, Jackals, and Infiltrators. as this will not increase the damage taken when under 50% health.or the extra 6% space. you still suffer from 25% slower movement speed. you better change the loadout to [Impact Ord] or any other component. This is by far the best combination you can use for your SFs with minimum drawbacks compared to the previous combinations! 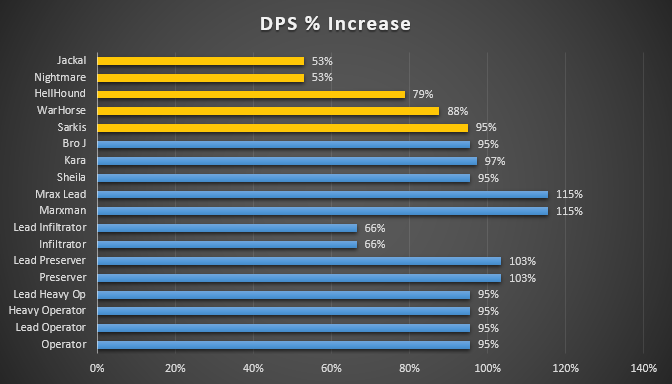 lower DPS% than the previous combinations, but with less drawbacks except for the movement speed reduction of 25% which can be mitigated by switching [Heavy Ordnance] with other loadout components like [Impact Ordnance]. I feel Battle Adrenaline is better than Press the Attack for leader command, overall. Am I right? If not, why? INCREDIBLE INFORMATION!!! THANK YOU FOR POSTING!!!... RESPECT FROM ONE MATH MAJOR TO ANOTHER!! try not to forget Compressed Magazine takes 10% more damage,so by using Caution Order which takes 12% less damage (above 50% health) it negates the damage taken from comp. mag. and adds 2% less damage on top of that. This thread and Wrong thinkers hidden stats thread should both be moved and PINNED to the strategy section so people will have easy access to them at all times.